The DeWalt DWA2T40IRC 40piece Impact Ready Screw Driving Set is part of the DeWalt Flexor line of power tool accessories. Flexor allows bits to flex up to 15 degrees which equals increased durability and reduced breakage for longer bit life. This set allows you to maximize you Impact ready system. It features a 10x Magnetic Screw Lock System for strong fastener retention and is preferred by professionals everywhere. The bits are placed directly in the impact driver; no run out and allows for access areas. It also minimizes drops and reduces wobbling. DEWALT MAX IMPACT screw driving bits are engineered to last longer than standard bits. The Dual Torsion Zone transfers optimal torque for Impact Driver use, while the Optimized tip geometry provides maximum fit, helping to reduce wear, stripping and cam-out. 2.5 inch bits and longer are compatible with the 10X Magnetic Bit Sleeve, providing users with precise placement and screw retention. Insert (1 inch bits) achieve optimized fastener magnetism with the DEWALT MAX IMPACT Bit Tip Holder. 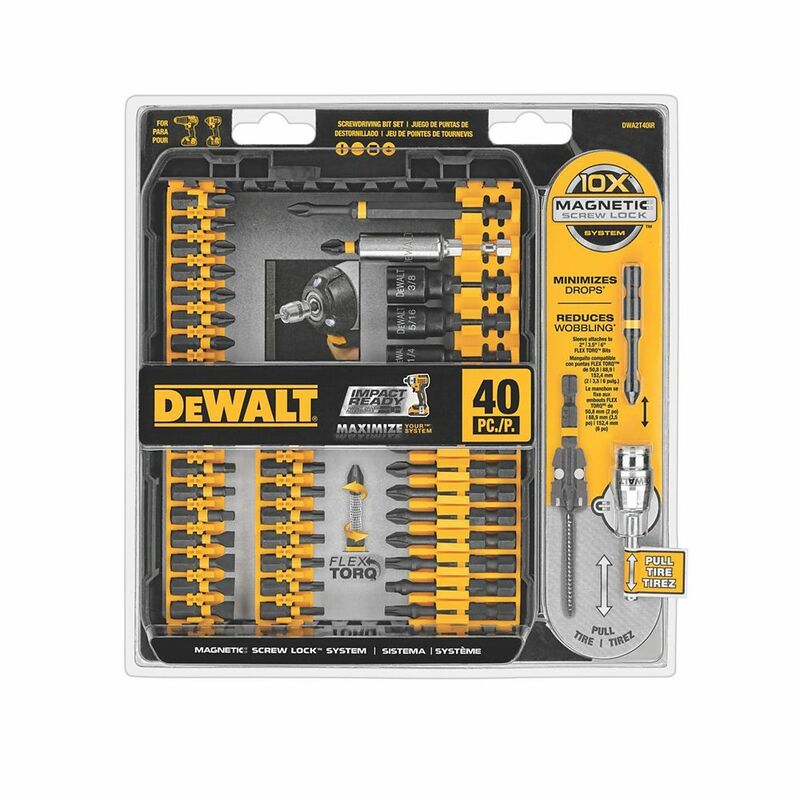 Flex Torq Screwdriving Bit Set (40-Piece) The DeWalt DWA2T40IRC 40piece Impact Ready Screw Driving Set is part of the DeWalt Flexor line of power tool accessories. Flexor allows bits to flex up to 15 degrees which equals increased durability and reduced breakage for longer bit life. This set allows you to maximize you Impact ready system. It features a 10x Magnetic Screw Lock System for strong fastener retention and is preferred by professionals everywhere. The bits are placed directly in the impact driver; no run out and allows for access areas. It also minimizes drops and reduces wobbling. Flex Torq Screwdriving Bit Set (40-Piece) is rated 4.0 out of 5 by 1.